This sleekly sculptured roadster (convertible) features a high-performance powertrain and hidden compartment that holds jump seats or storage space for golf clubs. It also features “wheels forward” architecture and voice-activated controls. This car was honored by AutoWeek magazine as the ‘best of the best” of all concepts revealed at 2001 international auto shows. The innovative drivetrain has a six-speed automatic transmission in front of 250-hp supercharged 3.4-liter V-6 (transverse mounted), rather than behind it. Among its heritage styling cues are portholes and strong vertical-bar grille. 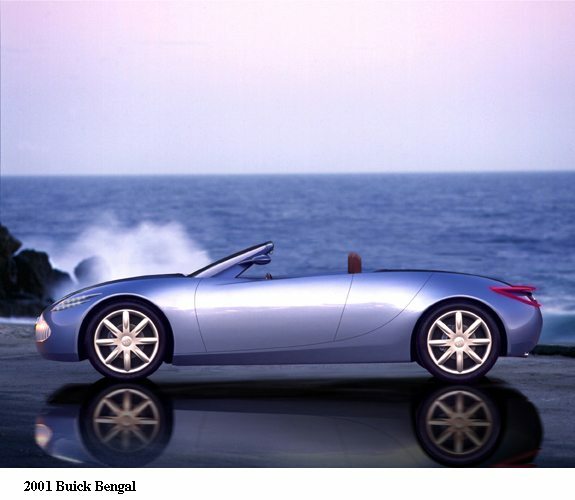 It was named with Buick spokes-person and golf superstar Tiger Woods in mind. It was painted a two-tone medium blue.